In the face of growing economic inequality and projections of increased disparities in the coming decades, Hawai‘i has passed a resolution to establish a Basic Economic Security Working Group. The working group will investigate the impact job automation will have on the residents of Hawai‘i and its social safety net programs, and investigate the feasibility of universal basic income models and other efforts to identify the best pathway forward to ensure residents are able to thrive. Representative Lee went on to claim that, when future socio-economic landscapes are viewed through the lens of innovation and automation, some form of a basic income “seems inevitable”. The representative states that it is imperative to “acknowledge there are real issues both in our economy and society that current policy is not equipped to deal with” and that our economic and social infrastructure must evolve to match the speed of technological innovations. Given that, in 2016, the service industry composed the majority of the state’s total GDP, automation may be one of the greatest challenges to its economic security in the near future. This threat is even more pressing given projections of the United States losing almost half of all jobs to automation in the next two decades. 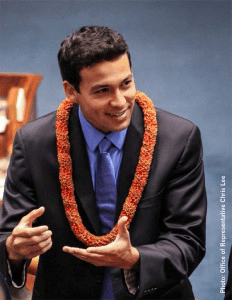 Hawai‘i’s resolution is proactive in addressing the specters of job loss and increased reliance on social safety net programs by mapping the potential future impact and mitigating negative effects with evidence-based strategies to inform legislation. The majority of households in Hawai‘i are families with children. Representative Lee is mindful of how their lives can be shaped by economic insecurity and is working to create pathways forward to ensure people can thrive.